LIVE PRESENTATION BY THE UTICANS--IN UTICA! The Uticans for 9/11 Truth will be giving a presentation, "Why the Official 9/11 Story is Wrong--and Why it Matters," at the Unitarian Universalist Church (10 Higby Road, Utica; telephone 315-724-3179) 7 PM Thursday, April 5, 2007. Herb Smith and Andy Senior formed the Uticans for 9/11 Truth in February 2006. The Uticans for 9/11 Truth are dedicated to demonstrating, through meticulous research and the applied laws of physics, the inconsistencies and absurdities in the offical explanation of events as embodied in the 9/11 Commission Report and the NIST report. They have appeared on local radio numerous times, and are regular guests on Vyzygoth's "From the Grassy Knoll," a popular internet radio program based in Florida. "It isn't our job to argue with internet and media critics of 9/11 skepticism, like the recent Popular Mechanics book," says Herb Smith. "The Official Story as offered by the government is the only one that matters, and the only one we're concerned with. And the government account is obviously and provably false." There will be a period for questions from the audience after the presentation. UTICANS FOR 9/11 TRUTH ON VYZYGOTH THURSDAY! UPDATE: This show is now available for listening for listening or download HERE. This Thursday, March 29, at 11 AM, Herb Smith and I will appear on VYZYGOTH'S "FROM THE GRASSY KNOLL" for a lively discussion regarding what's hitting the fan in the realm of 9/11 Truth, with archived audio soon to follow. On Pete Bianco's WHCL show Wednesday--IMPEACHMENT? Listen to WHCL 88.7 FM or WHCL.ORG this Wednesday at 9:00 AM EDT. Pete Bianco will interview State Senator Gerald Ortiz y Pino. New Mexico State Senator Gerald Ortiz y Pino has sponsored resolution SJR 5 petitioning congress to commence the investigation of and impeachment proceedings against President George W. Bush and Vice president Richard B, Cheney. This would be a "state-based" impeachment procedure, based on the notes in Jefferson's Manual, which indicate that impeachment proceedings may be initiated by the transmission of charges from a state legislature. $20 BUCKS -- NICE VIDEO! You gotta also love "The Blue Danube" soundtrack. We were moved by this tribute to our friend Vyz written by Angie Riedel and appearing on her pbsBlog this week. We hope she doesn't mind us republishing it here, because we feel the same way. One of the best things that can happen to us as we go through life, is having the luck to stumble across really great people. People who end up making a difference in our lives, in a really good way. In this age of technology it's not even necessary to meet someone in person to be able to partake of what they're doing in the world and to benefit profoundly from that work. Today I want to introduce you to someone who deserves recognition for being one of these extraordinary people. He is known as Vyzygoth and he does a radio program on the internet called The Grassy Knoll. Vyz's radio program is unlike any other. Besides being commerical free, his show provides his listeners with a launch pad to understand the real world. The diversity of his guests and the wide range of topics he covers are the most significant learning tool I have ever discovered. 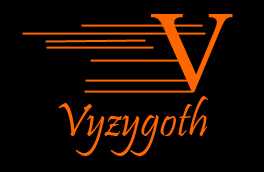 Simply put, Vyzygoth is a catalyst to empowered self learning he deserves recognition for his contribution to our times and our lives. It is absolutely true that anyone who listens to him regularly, even for a short period of time, will come away forever changed. I found The Grassy Knoll archives on the A-Infos web site about a year or so ago, then went to Vyzygoth's website where I listened to the current archives which he leaves freely available to all who are interested in hearing them. There was a heck of a lot there of real importance. I was introduced to a wide range of things about life in America that many of us know absolutely nothing about. Many of the guests on his show talked about things I found fascinating and I often wanted to find out more about what they were saying. I quickly learned to make sure I had a good chunk of time set aside before visiting the archives because it always happened that one thing would lead to another and I would end up on a voyage of discovery that sometimes lasted for days. My own journey of self-education about the real way that things happen in the real world has been going on for 2-1/2 years, and I have learned a lot. Vyzygoth's Grassy Knoll weekday show has played a significant part in my process of becoming informed; and how many radio programs can you say that about? The first thing I got about Vyz was that he knew a whole lot about the world. He knows history and current events and he's obviously an avid reader. I felt like a neophyte rube when I first listened to him because I often knew little or nothing of what he was talking about. This spurred me to do my homework and get informed about literally countless things that I now understand play a pivotal role in how this world works. His "regular guy" voice made me feel welcome, but I had to listen for a long time before I sheepishly emailed him to let him know how much I appreciated his show. I didn't expect a reply but I got one. One could easily get the impression that Vyz has plenty of time on his hands because he responds to the emails he receives and at times will put substantial time and energy into these electronic conversations. It wasn't until I was a guest on his show that I began to realize how huge his audience really is, based on the number of visits that came to my websites after the show. It knocked my socks off. Vyz is an enabler in the right way. He seeks to connect with his community, and then to inter-connect his community. He asks for nothing in return. He is consistent, sincere, and one knows that he is what he seems to be, there is no facade there, he wears his heart on his sleeve. Always the gentleman, he is genuinely free of egotistical behavior, and he always treats people with courtesy. He talks to people who have vast amounts of specialized in depth knowledge in a way that always puts the spot light on the guest, allowing them the free space and time to relate substantial chunks of useful information and which also allows the guest to become a presence of note to the listener. It is wonderful the way Vyz assumes such an unaffecting role, but it cannot and never does camouflage his own amazing breadth of knowledge and understanding of so many things. It's almost difficult to express my appreciation for Vyz and his body of work. I have grown to really admire this man. His strong sense of ethics, his wonderful sense of humor, his ability to cut to the hidden heart of the matter, his excellent instincts, his uncanny knack of seeing what others may not see, and his skills as a radio host all combine to create a gift of substance and uniqueness, something that is personally useful and important to me, and I want to thank him for all of it. He deserves to be acknowledged for his very real contribution to us. I know that Keith Hansen is a very admired and well liked person to so many people from all over the world, and on so many different levels. For recognition of excellence in your work Vyz, accept my heart felt gratitude, appreciation and affection. You're one of a kind and you have changed my life for the better in a way no one else ever has. BUBBA CALLS FOR "NEW WORLD ORDER"
More (but worse video quality) at THIS LINK. And here's MORE CREEPY CRAP from the Slick One. Regarding "Patriots Question 9/11" . . . Thanks. That's an interesting list of heavy hitters. I think such a site might be useful to unblock the seriously mentally constipated, who just sit there and wave their flags in support of killing the A-rabs. What these luminaries do have in common is they all think something stinks. Once people get into the thick of this 9/11 material, the matter of what "authorities" say fades into insignificance. Lots of these people still drink their malteds at the Limited Hangout, and support the 19-Arabs-with-boxcutters-who-hate-our-freedoms hypothesis but feel that the administration didn't do enough to stop the attacks with the information they had. This is akin to LIHOP, which is slightly more sinister--that the administration "let it happen on purpose" to further their own agendas. Plenty of those types there, too. Then there are those who feel that a cabal of people in the government--and the corporate community--were directly complicit in the attacks, but have bizarre theories about the events and outside agendas (and may in fact be government-sponsored controlled opposition). Morgan Reynolds is the most notorious of these, since he has promoted Judy Wood and her whole "space beam" scenario. These guys get shot down easily, and give the Fox cheerleaders for Bush-Cheney the opportunity to chortle about "tin-foil hats." Some of the people on the list are sincere, and have said some really good things. Of all the bigwigs cited, I think Ron Paul and Bob Bowman are probably the least sullied. But it really doesn't matter who they've got upon the list, because authority does not necessarily equal veracity. Herb Smith and I have gone from being supporters of the Scholars for 9/11 Truth to seriously questioning everyone and everything in the so-called 9/11 Truth Movement. Ultimately, names and credentials don't matter. Slickly produced movies that millions of people download from the internet don't matter (though some of the videos are quite good). What matter are the facts, and the immutable laws of physics that seem to have been disregarded by the 9/11 Commission Report and the National Institute of Standards and Technology (NIST) in concocting their Official Theory. Chemistry and metallurgy matter. Above all, a sensible interpretation of the physical evidence matters. This may lead to some uncomfortable and unanticipated conclusions, but this is what we're about. Maybe having all those big names on "our" side will effect some changes--but if the change means merely dumping the evil Republicans in favor of the pure and virtuous Democrats, then we will have been had. A Hillary presidency will prove that the "movement" was part of the plot itself. Of course, when Madame Clinton begins to pull the same crap that Bush-Cheney are perpetrating with regard to abrogating civil liberties, loss of economic freedom, continuing the war(s), etc., the Dems will tell us to shut up and enjoy our spinach. All we have are the facts. We [by which I mean "all of us"] have to interpret them with a clear head and think for ourselves, and everyone else can go to hell. Angie Riedel, the grassroots activist who created the excellent pbsBlog and Think or Be Eaten (and who has been gracious enough to link to our site) has just added an audio component to her work. Download her program "Making a Difference" HERE. UTICAN FOR 9/11 TRUTH ON VYZYGOTH TODAY!! More Pay-triot Games on Vyzygoth's Grassy Knoll. Archive HERE. After studying more than 50 options throughout the New York region, Salomon signed a 20-year lease for 22 floors - each spanning nearly an acre - at Seven World Trade Center, an office tower that has been largely vacant since Silverstein Properties completed it two years ago. "We really had a time constraint," explained Gedale B. Horowitz, a senior executive director of Salomon. "And we were driven very much by technology. We had to find a building that could accommodate our needs, including major-sized trading floors." Much of the new electrical, air-conditioning and mechanical equipment will serve three double-height trading floors. To create the extra height, workers are removing most of three existing floors, using jackhammers to demolish concrete slabs and torches to remove steel decking and girders beneath the concrete. . . In some office buildings, that alteration would be impossible, but Silverstein Properties tried to second-guess the needs of potential tenants when it designed Seven World Trade Center as a speculative project. "We built in enough redundancy to allow entire portions of floors to be removed without affecting the building's structural integrity, on the assumption that someone might need double-height floors," said Larry Silverstein, president of the company. "Sure enough, Salomon had that need. "And there were many other ways that we designed as much adaptability as possible into the building because we knew that flexible layout is important to large space users." Nearly 2,000 people will be working on the retrofit project during the peak period. The cost, which is estimated at $200 million - not including carpeting, furniture and other office equipment - will come out of Salomon's pocket. "We made a landlord contribution to the work," Mr. Silverstein said, "but Salomon's costs will go well beyond that contribution by many, many times." More than 375 tons of steel - requiring 12 miles of welding - will be installed to reinforce floors for Salomon's extra equipment. Sections of the existing stone facade and steel bracing will be temporarily removed so that workers using a roof crane can hoist nine diesel generators onto the tower's fifth floor, where they will become the core of a back-up power station. Yep. Definitely fire. Or seismic shock. Or structural damage. Or all of the above. Counterpunch, the radical leftwing magazine, commissioned its own expert - an aerospace and mechanical engineer - to test the official findings. He shows that the institute must have been right. He also demonstrates how Building 7 collapsed. Burning debris falling from the twin towers ruptured the oil pipes feeding its emergency generators. The reduction in pressure triggered the automatic pumping system, which poured thousands of gallons of diesel on to the fire. The support trusses weakened and buckled, and the building imploded. Popular Mechanics magazine polled 300 experts and came to the same conclusions. Uh, it would be structural damage and fire, then? Okay, George. Bubba spills the beans. So, why don't you pass the time with a game of solitaire? The 9/11 conspiracy theories are a displacement activity. A displacement activity is something you do because you feel incapable of doing what you ought to do. A squirrel sees a larger squirrel stealing its horde of nuts. Instead of attacking its rival, it sinks its teeth into a tree and starts ripping it to pieces. Faced with the mountainous challenge of the real issues we must confront, the chickens in the "truth" movement focus instead on a fairytale, knowing that nothing they do or say will count, knowing that because the perpetrators don't exist, they can't fight back. They demonstrate their courage by repeatedly bayoneting a scarecrow. We're not the squirrels here, George.